What is West Metro About?? 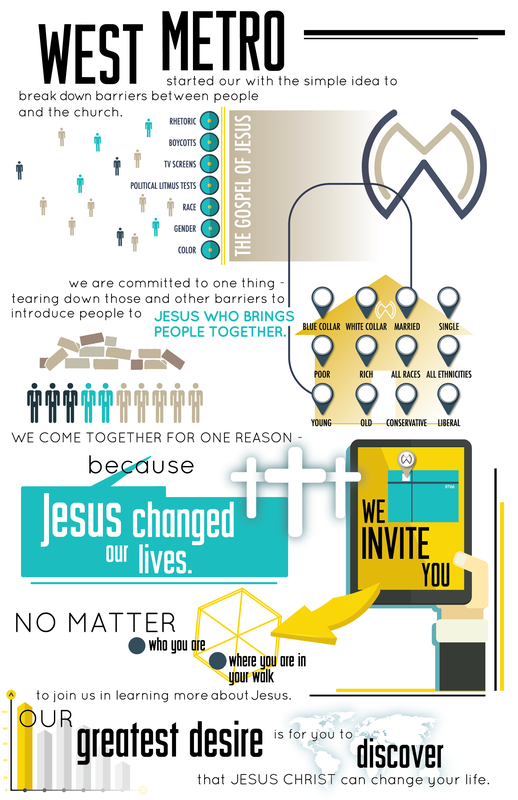 We believe that Jesus is the reason we are here. His death and burial and resurrection opens the door for us to be brought back into a relationship with God through the forgiveness of our wrongs committed against God and each other. We believe that the family is the first church anyone attends. In our families, we learn what is most important and we want our families to be committed to making Jesus the most important thing. Our homes become lights in a dark world where others can meet Jesus for the first time. We believe that Jesus has shown us mercy and as a result we should show the same to other people. We choose to be quick to forgive, aid, and assist other in need because Jesus came to us at the moment we needed Him the most. We believe that no one should have to hide their weakness, brokenness, mistakes, struggle or questions. You would have to work hard to shock us. We believe the church should be a safe place to be yourself as we seek to become less like our old selves and more like Jesus. Your questions, your frustrations, your old wounds, and your doubts are all welcome because Jesus welcomed us with all of that and more. What should I expect when I come to West Metro? Expect to see a group of friendly people worshiping God and hearing a relevant message from the Bible. Who’s in charge at West Metro? WMCC is an elder-led congregation. Six men serve as the Elder Council guiding the church in fulfilling the vision to which God has called us. The Elders lead by seeking God’s best for the church and pointing WMCC to follow Him. As a result, Jesus is the head of the church and authority over the elders and the congregation. Wear what you are comfortable in. Our pastors and staff will probably have on jeans or shorts and the people in the crowd will be comfortable as well. You can dress up if you want, but it’s not necessary or expected. We have classes for kids from birth to 5th grade or, if you like, they can stay in service with you. Our children’s workers are background checked and love kids. They will teach a lesson, learn songs, do art, and all kinds of fun kid things. Can I meet the pastor after the service? Yes. We think it’s important for you to be able to talk to the pastors and staff, to be able to ask questions or receive encouragement.